Welcome to Baumwerkshop. My name is Jack Baumgartner. 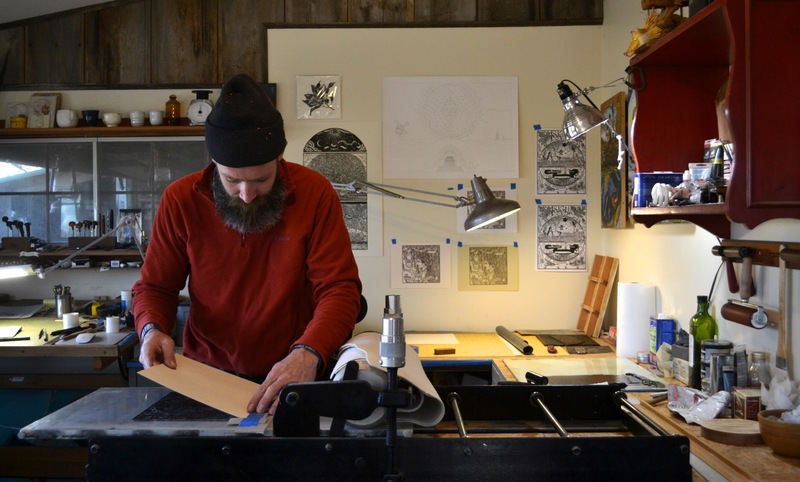 By profession, I am a painter, printmaker, woodworker and a sheep farmer in Kansas. I maintain The School of the Transfer of Energy, and on Instagram, I am @baumwerkj. By way of a welcome, I would like to invite you into my scruples about this whole endeavor. Marketing my own work has always represented precarious territory. At a fundamental level, I am much more interested in making my work than trying to sell it. Philosophically and morally, I struggle with the slippery slope of salesmanship and authenticity. Authenticity as a word has already been pretty much trashed by our cultural trend towards filtered-authenticity in order to generate likes and sell products. I am certainly guilty of it, myself. Likes are addictive. But it all leaves me with a bitter taste in my mouth. It is hard to not feel like marketing, even just sharing, breeds a certain level of dishonesty that we have decided to just be ok with as a society. My work is often both deeply personal and (I hope) relatively spiritual. I struggle often with the feeling that I am prostituting both myself and the things of God when I set out to peddle these visual representations in the marketplace. I don’t really have a satisfying resolution for this uncomfortable feeling, except for the opposing weight of the reactions of “my” audience, expressing a desire to share in these things. I do want to sell my work and provide an income for my family and finance future projects. It is a part of life and a part of growing, of being fruitful. It is part of work, which is a divine invitation. I have a calling to make art and what I hope are beautiful objects, and useful pieces of furniture. I have a calling to make that work accessible to the culture I am a part of. I want to try to do that in as straightforward a way as I know how. This new web store is an effort to do that. I really do hope that you enjoy your visit and will let me know what you think. I also really hope that you might purchase something, if you see something you like. There should be some exciting new things showing up there in the coming weeks. Thank you, for supporting me and following along on this journey. God is good.